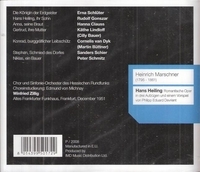 “Although Heinrich Marschner’s work has been generally neglected in the 20th century, Marschner was a leading figure in German Opera in the period between Weber and Wagner, and wrote twenty-three operas and singspiels. He was born in Zittau, in 1795, and although studied law at the University of Leipzig, spent a considerable time developing his love of music. A meeting with a Hungarian nobleman, Count Thaddaeus Amadée de Varkony, led to an attempt to induce Beethoven to accept Marschner as a pupil, in 1815. In Dresden, Marschner was appointed Weber's assistant in 1823, although he had hoped to offer the position to his friend Johann Gänsbacher, to whom he was under some obligation. Relations between Weber and Marschner were never smooth, and the latter seemed to resent the obvious musical and dramatic influence that Weber perceptibly had on his own work. In 1824 Marschner became director of the German and the Italian opera in Dresden, undertaking, as he complained, most of the duties of Weber and of Morlacchi, the superintendent of the Italian opera. In 1827 Marschner returned to Leipzig, where his opera DER VAMPYR, a subject of topical interest, won success. This was the first collaboration with his brother-in-law, Wilhelm August Wohlbrück, which was to continue through many of Marschner's most successful theatre works. DER VAMPYR was followed by an opera derived from Sir Walter Scott's IVANHOE - DER TEMPLER UND DIE JÜDIN.